Sun City Mesquite is Del Webb's latest masterpiece 80 miles northeast of Las Vegas, Nevada. A top-notch amenity center, abundant recreational opportunities, world-class golf, and inexpensive homes make Sun City Mesquite a major draw for Las Vegas' active adults. Sun City Mesquite and the surrounding town retain a quiet solitude that not all active adult communities in the Las Vegas area enjoy. The isolation from crowds and inexpensive housing has drawn many retirees to the area as a logical alternative to the more crowded areas around the city. With an average of 300 days of sunshine a year, low humidity and no state income tax, it is clear to see why Mesquite, Nevada has made a name for itself among retirees. Perched on a hill overlooking Sun City Mesquite is the 30,000 square-foot Pioneer Center, which serves as the recreational and social centerpiece of the community. The Pioneer Center is home to some of the most sought-after amenities favored by today's active adult buyers. For community gatherings, the Sun City Mesquite clubhouse hosts a ballroom, billiards room, lounge, and hobby and craft studios. It also includes a state-of-the-art fitness center that offers an exercise studio and high-end cardiovascular and weight-training equipment. The fitness center is surrounded by an indoor walking track that overlooks an indoor lap pool and outdoor resort-style pool and two spas. The Sports Pavilion adjacent to the Pioneer Center is the main attraction for sport and fitness-minded individuals. It includes seven bocce ball courts, four tennis courts, six pickleball courts, and a basketball court. Plus, a professionally designed 18-hole putting course offers the ideal place to practice your short game. Sun City Mesquite boasts more scenic walking and biking trails than any other Del Webb community in the country. The Conestoga Golf Club in Sun City Mesquite opened in 2009. The 7,204-yard par-72 course designed by famed golf course architect Gary Panks is sure to provide a memorable and challenging round of golf for both novices and experts. With a backdrop of beautiful hilltop mesas and elevation changes of over 1,000 feet, every hole offers an opportunity for dramatic shots and mesmerizing views. Natural canyons and native desert combine to create the appearance of a course crafted by nature and forged over time. Sun City Mesquite residents and their guests enjoy discounted rates and preferred tee times. Del Webb began selling at Sun City Mesquite in 2007 and the community was an instant success. Hundreds of people lined up to become a part of the next big thing in active adult living. Upon completion, the community will be home to over 3,500 residences. Home buyers can select from 21 single-family ranch floor plans that range in size from approximately 1,200 to over 3,100 square feet. All homes feature a minimum of two bedrooms, two baths, and two-car garages. Larger homes offer up to three bedrooms, three-and-a-half bathrooms, three-car garages, and optional casitas. The homes include the latest desirable finishes and available upgrades such as gourmet kitchens, spacious great rooms, and abundant outdoor living space. True to all Del Webb communities, lifestyle is the focal point at Sun City Mesquite. The ability to lead a physically active or socially engaging lifestyle is hallmark to all Del Webb communities and Sun City Mesquite is no exception. A full-time activities director is continually crafting a calendar filled with fun activities, classes, and social opportunities. Every week in Sun City Mesquite, residents have access to a wide range of clubs, interest groups, and events. There are already several dozen clubs, interest groups, and classes in Sun City Mesquite and the list grows longer every week. Regardless of your passions in life, you are certain to find other individuals who share your interests. There are several clubs and events to join to socialize with your neighbors like community potlucks, holiday parties, or the book club. Meet your fitness goals with friends by taking part in yoga, Jazzercise or by playing a game of softball. For the more creative-oriented residents, Sun City Mesquite offers a woodworking group, the art studio group, and the photography group. Whether you want to pick up a new hobby, improve a current one, or simply mingle with your neighbors, the activities at Sun City Mesquite will satisfy. 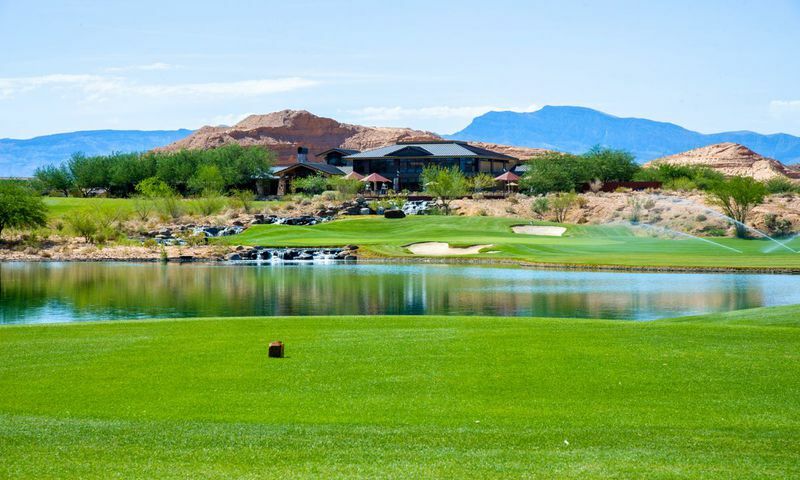 Mesquite used to be one of the best-kept secrets for retirement destinations in the Southwest. Since Del Webb's opening of Sun City Mesquite in 2007 the word is out. The region has a lot to offer including an abundance of outdoor recreation, hiking, mountain biking, and some of the most dramatic golf courses in the country. Mesquite is a small town 80 miles northeast of the glamour and glitz of Las Vegas, Nevada. It is situated along the Nevada and Arizona border only 40 miles from St. George, Utah. Less than 20,000 residents call Mesquite home but the town's population has been known to increase substantially in winter months as northern "snowbirds" flock to the region to enjoy the mild winters and company of other retirees from across the country. Despite its relative isolation, Sun City Mesquite is about 90 miles from the McCarran International Airport and less than three miles from Interstate 15. With its numerous recreational facilities, modestly-priced homes, and beautiful location, Sun City Mesquite is one of the most desirable active adult communities in Southern Nevada. The Pioneer Center Clubhouse is Sun City Mesquite's hub for social and physical activity. Pioneer Center Clubhouse - 30,000 Sq. Ft.
Sun City Mesquite residents enjoy discounted rates and preferred tee times at Conestoga Golf Club that weaves throughout their community. There are plenty of activities available in Sun City Mesquite. Here is a sample of some of the clubs, activities and classes offered here. There are three floor plans in the Cottage Collection (Series 1). These homes range from 1,241 to 1,449 square feet making them ideal for downsizing homebuyers who want maximum use of minimal space. This series offers two to three bedrooms, two baths, a covered patio and two-car garage. The two larger plans offer an extra den. The Classic Collection (Series 2) single-family homes introduce more square footage and larger living areas. Ranging from 1,569 to 1,863 square feet these homes provide ample space at a practical price. All homes include two to three bedrooms plus a den, two baths, a covered patio and a two or two-and-a-half-car garage. For homebuyers who want ample room, oversized great rooms, extra garage space and luxury finishes, the Premier Collection (Series 3) homes are the answer. Each plan offers an optional third-car garage or casita. With two to four bedrooms and two to three-and-a-half bathrooms per plan, these homes are great for couples who like their space or a place to host out-of-town guests. The Retreat Collection offers four single-family models. These homes range in size from 1,573 to 2,010 square feet and feature one to three bedrooms, two bathrooms and a two or two-and-a-half-car garage. Most homes also feature a den. The Encore Collection offers three new single-family models. These floor plans range from 2,023 to 2,514 square feet and feature two to three bedrooms, two to two-and-a-half bathrooms and an attached two-car garage. Most homes feature a den and also come with an additional half garage option. The Estate Collection (Series 4) homes are the largest homes offered in Sun City Mesquite. With 2,645 to 3,116 square feet these homes are built to impress. Expect high-end finishes, oversized rooms and a touch of elegance around every corner. These homes have two to four bedrooms, at least two-and-a-half bathrooms, and an attached two-and-a-half to three-car garage. We purchased a new home in Sun City, Mesquite 6 months ago. If there is an issue,Daryl will get ou immediately and resolve it. He is an incredible asset to the company. My wife and I love it here. We moved from a gulf coast condo with an absolutely toxic HOA. I believe there will always be areas of disagreement in any HOA, but what we’ve experienced here over the last 18 months has been very unintrusive. Pulte does indeed have controlling interest in the Board of Directors, but personally I find this somewhat comforting. After seeing first hand what a novice Board can do to an HOA when personal interests outweigh any greater good, I’m actually a bit relieved the Board is directed by an entity with a couple thousand lots left to sell. Nice place to live. But builder and the HOA, run by the builder does not have the interest of the residents even on the radar. I say buy elsewhere. excellent neighbors! fun community - you can be involved or not - your choice! Del Webb has done an amazingly outstanding job planning and building Sun City Mesquite. It's a jewell largely undiscovered in my view. I purchased a home in Sun City Mesquite, Nevada in September of 2013 and looking back, I'd make the same decision today as then! As a retired Air Force colonel and made too many moves to list here, before picking Sun City Mesquite I thoroughly researched all 55Plus communities in every state in the country, and for me I still am confident my decision to purchase and live in Sun City Mesquite was the best decision of all alternatives and among the best decisions I've made in my entire life. My reasons are numerous. I'll succinctly list a few of my more important reasons here: Breathtaking views & landscaping throughout the community; unprecedented hiking & bike trails; amazing golf course and club house; large indoor & outdoor pool, exercise room and entertainment facilities; clean air & low humidity; excellent climate and even cool mornings and evenings during the hottest three months of the summer; outstanding home values for living in an amazing resort style community; absence of traffic; only an hours drive to a major airport; half-our drive to St George, UT with abundant shopping and other amenities; short drive to southern, CA beaches; some of the best National Parks in the county; short drive to skiing and winter sports such as in Park City, UT; 7-hour drive to Lake Tahoe and approximately 2-hour drive to Lake Powell and Lake Meade; Vegas itself and all it has to offer; and last but not least, it's adjacent to the wonderful small town of Mesquite... the list goes on and on! Thanks to Del Webb's vision and believing hope is not a plan and belief in the adage, "You don't plan to fail but fail to plan," I'm the happiest I've ever been in my entire life and know each day the best days of my past will be the worst in my future! Thanks Del Webb...you guys are wonderful--the BEST! My wife and I are extremely lucky to have found this hidden gem in Nevada. The people are so friendly and there is plenty to do, both within the community and nearby. Small Town charm with Las Vegas and St. George nearby for any big city needs you can imagine. The views are just great where ever you walk to and Sun City does such a nice job of keeping up the common areas. You can be just as active (golf, pickle ball, tennis, swimming) or as serene (cards, pottery, stained glass, pool) as you would like. We came across this community after we looked at some places closer to Vegas. We fell in love with the mountain views and we like the smaller-town feel. The clubhouse is fantastic and we use the indoor walking track and pool at least once a week. The fitness center is really well maintained and the equipment is great. We love golfing here and practicing on the nice putting green. I'm finally a good putter! 55places.com is not affiliated with the developer(s) or homeowners association of Sun City Mesquite. The information you submit is distributed to a 55places.com Partner Agent, who is a licensed real estate agent. The information regarding Sun City Mesquite has not been verified or approved by the developer or homeowners association. Please verify all information prior to purchasing. 55places.com is not responsible for any errors regarding the information displayed on this website.